How many uninsured people need additional help from taxpayers? When discussing health insurance we frequently hear that there are “46 million uninsured” in America. This figure is from a monthly survey of about 50,000 households done by the Bureau of Labor Statistics and the Census Bureau. This Current Population Survey (CPS) then uses statistical techniques to paint a picture of the entire U.S. population. This looks really bad. At least there are more than 250 million people with health insurance – that is clearly a good thing that we never hear it in the press. Still, there’s a lot of red there. It means that in 2007 (15%) of Americans lacked health insurance, according to the CPS. Advocates, some elected officials, and the press round that number up to “1 in 6 Americans.” We hear that there are “46 million uninsured,” and then we jump to the conclusion that government needs to help 46 million people buy health insurance, subsidized by taxpayers. First, I need to make a technical disclaimer. I had this same detailed breakdown for 2005 data, done by health experts when I was part of the Bush Administration. I now have a 2007 total (45.7 million), and so I have proportionately adjusted the components to match that new total. It is a back-of-the-envelope calculation, but I am confident that it is solid, and it does not move any component by more than two hundred thousand. In addition, the expert analysis I am using ensures that the subdivisions shown above do not overlap. I will slightly oversimplify that point in the following description of the breakdown to make the explanation readable. Let us walk through the graph from top to bottom. 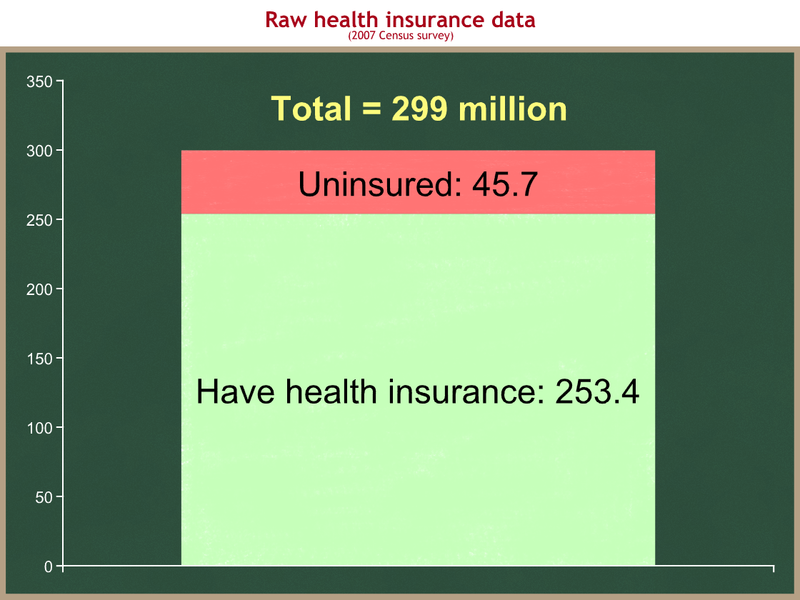 There were 45.7 million uninsured people in the U.S. in 2007. Of that amount, 6.4 million are the Medicaid undercount. These are people who are on one of two government health insurance programs, Medicaid or S-CHIP, but mistakenly (intentionally or not) tell the Census taker that they are uninsured. There is disagreement about the size of the Medicaid undercount. This figure is based on a 2005 analysis from the Department of Health and Human Services. Another 4.3 million are eligible for free or heavily subsidized government health insurance (again, either Medcaid or SCHIP), but have not yet signed up. While these people are not pre-enrolled in a health insurance program and are therefore counted as uninsured, if they were to go to an emergency room (or a free clinic), they would be automatically enrolled in that program by the provider after receiving medical care. There’s an interesting philosophical question that I will skip about whether they are, in fact, uninsured, if technically they are protected from risk. Another 9.3 million are non-citizens. I cannot break that down into documented vs. undocumented citizens. Another 10.1 million do not fit into any of the above categories, and they have incomes more than 3X the poverty level. For a single person that means their income exceeded $30,600 in 2007, when the median income for a single male was $33,200 and for a female, $21,000. For a family of four, if your income was more than 3X the poverty level in 2007, you had $62,000 of income or more, and you were above the national median. 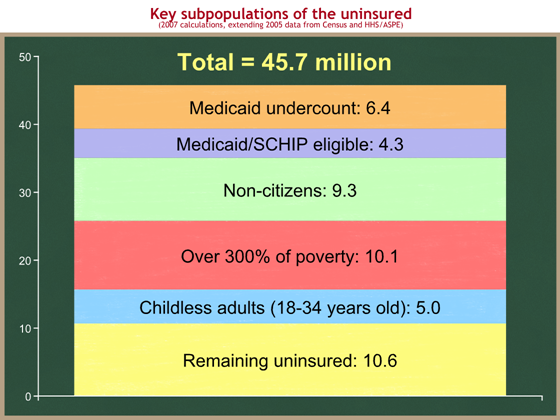 Of the remaining 15.6 million uninsured, 5 million are adults between ages 18 and 34 and without kids. and not a childless adult between age 18 and 34. As a policy matter, we care not about the total number of uninsured, but about the subset of that group that we think “deserves” taxpayer-subsidized health insurance. That is a judgment call that involves some value choices. I will make one value choice for you and boldly assert that, if you are already enrolled in or eligible for one free or heavily subsidized health insurance program, we can rule you out as needing a second. That simple statement reduces the 45.7 million number down to 35 million, by excluding the Medicaid undercount and Medicaid/SCHIP eligible from our potential target population. I think most people would also say that the 10.6 million I have labeled as “remaining uninsured” and shaded in yellow above are the most sympathetic target population. Should people with incomes near or above the national median get health insurance subsidized by taxpayers? How about non-citizens? Should we distinguish between documented and undocumented non-citizens? Between those who pay taxes and those who do not? Remember that we are not talking about who should get emergency medical care, but instead who should get taxpayer subsidies to finance the purchase of pre-paid health insurance. Does that change your answer? Many young adults and childless couples are in good to excellent health. Do they deserve subsidies, when they may be making what they believe to be a rational economic decision and using their financial resources for things other than buying health insurance? Should a 25-year old Yale graduate triathlete making $30K per year get his health insurance subsidized by taxpayers if he chooses not to buy it because his budget is tight? There is no clear right or wrong answer to the above questions. You need to make your own value choices for them. Now let us look at the effects on the totals for several hypothetical answers to these questions. Remember that the advocates, some elected officials, and press tell us that the numbers are: 46 million uninsured, 15% of the population, and 1 in 6 Americans “are uninsured.” I suggest you try to figure out which of the following is closest to your view. Ann wants to subsidize everybody, but agrees that we don’t need to double-subsidize. She excludes the Medicaid undercount and Medicaid/SHIP eligible from her target population and ends up with 35 million people. That is still an enormous amount, but it is 10.7 million less than the headline number she heard in the news. Her target population is now 11.7% of the total U.S. population, down from 15%. Put another way, she would like taxpayers to help between 1 in 8 and 1 in 9 Americans who she feels are deserving of subsidies to buy health insurance, rather than the 1 in 6 she heard in the press. Bob agrees with Ann, but thinks that subsidies should go to the poor, or at least not to those who have above the median (or near median) incomes. His target population is therefore about 25 million people, way down from 46 million. That is 8.4% of the total U.S. population, or 1 in 12 Americans. That is still a huge problem, but it is very different from 1 in 6. Carla agrees with Bob that subsidies should not go to those with incomes near or above the national median. She also thinks that undocumented citizens should get emergency medical care, but not taxpayer-subsidized pre-paid health insurance. I will guess a 50/50 split between documented and undocumented of the 9.3 million uninsured non-citizen, and I would appreciate it if someone could help me refine this. With this assumption, Carla’s target population is about 21 million, or 7% of the total U.S. population. That is roughly 1 in 14 Americans. Doug thinks only American citizens with incomes below the national median (and who are not already eligible for another program) should be eligible for additional aid. His target population is therefore the bottom two bars on the graph, or 15.6 million people. That is 5.2% of the U.S. population, or 1 in 19 Americans. If Doug were to further limit subsidies to those below 200% of poverty or 150%, his target population would be a few million people smaller. Edie agrees with Doug, but thinks that if you are a young adult without kids, you should fend for yourself. Her target population is 10.6 million people, or 3.5% of the total U.S. population. That is 1 in 28 Americans. These are, of course, not the only possible answers, but I think they are a representative bunch. Even for the most “liberal” set of answers (Ann’s), the headline numbers we hear in the press overstate the extent of the problem by more than 10 million people. Now even Edie’s narrowest 10.6 million target population is still a lot of people who lack health insurance. So why does it matter that the press gets the numbers wrong? If we misdiagnose the problem, we could easily design the wrong policy solution. A solid quantitative understanding of who we would like to help and why is important. Health insurance subsidies cost taxpayers tens of billions of dollars each year. If we target these funds well and prioritize, we can help more of the people whom we think are deserving of additional assistance, and fewer of those who need less help. If we target those funds poorly, we will waste a lot of money. This point is independent of the total amount we spend on subsidizing health insurance. Health insurance competes with other policy goals for an enormous but still ultimately limited pool of taxpayer funds. We should neither overstate nor understate the problem to be solved, so that the tradeoffs with other policy goals can be considered fairly.